At Distributed Proofreaders, we are all volunteers. We are under no time pressure to proof a certain number of pages, lines or characters. When we check out a page, we can take our careful time to complete it. We can choose a character-dense page of mind-numbing lists of soldier’s names, ship’s crews, or index pages. We are free to select character-light pages of poetry, children’s tales or plays. Of course these come with their own challenges such as punctuation, dialogue with matching quotes or stage directions. We can pick technical manuals with footnotes, history with side notes, or science with Latin biology names. We can switch back and forth to chip away at a tedious book interspersed with pages from a comedy or travelogue. 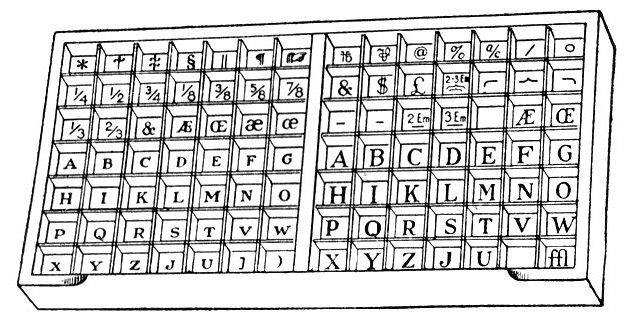 Every so often though, I stop and think about the original typesetters. They didn’t get to pick their subject material, their deadline or their quota. They worked upside-down and backwards. They didn’t get to sit in their own home in their chosen desk set-up, with armchair, large screen, laptop or other comforts. Though we find errors in the texts that they set, many books contain very few of these errors. When I pause between tedious pages, I wonder how they did it. Beyond the paycheck, what motivated them to set type on the nth day of the nnth page of a book that consisted mostly of lists, or indices? Even for text that would be more interesting to the typesetter, the thought of them having to complete a certain number of pages in a given day to meet a printing deadline is just impressive. I know many have jobs today that require repetitive activities. But how many are so detail-oriented, with no automation, that leave a permanent record of how attentive you were vs. how much you were thinking about lunch? Maybe it was easier to review and go back and fix errors than I picture it to be. Maybe they got so they could set type automatically and be able to think of other things or converse. When I’m proofing a challenging page, I sometimes think of that person who put those letters together for that page. I realize my task is so much easier. If I want I can stop after that page and hope some other proofer will do a page or two before I pick up that project again. I can stop, eat dinner, and come back tomorrow to finish the page when I’m fresh. I imagine a man standing at a workbench with his frames of letters and numbers and punctuation at one side, picking out the type one by one, hoping that the “I” box doesn’t contain a misplaced “l” or “1.” I see him possibly thinking about how much easier life is for him than it was for the medieval scribe. The scribe was working on a page for days, weeks, even months, one hand-drawn character at a time. I see the typesetter appreciating how much improved his own life is and how much more available his work makes books to his current readers. And I smile as I see him smile. Typesetting is a topic close to the hearts of many DPers, and the foundation on which the books we work on were built. I learnt typewriting on a manual typewriter when I was at school. A classmate secured a job as an editor with a magazine based on the skills she learnt in the course we were doing. I was so envious! Editor on a magazine, with no work experience, and no qualification. A few years earlier, when asked by a teacher what I wanted to be, I replied I wanted to be a journalist, not because I wanted to be a writer, but because I wanted to work on newspapers, with those monstrous printing presses and the glorious smell of ink, and fiddly bits of lead. I did manage to become a journalist and editor, but the huge presses were ageing, and typesetting was becoming regarded as no more than wordprocessing on a computer. I remember being chastised for the miles of galley paper that spewed out of the printer one time when I forgot to close off the heading command properly and ended up with a whole article in 72-point Times, a somewhat expensive mistake as rolls of galley proof paper were not cheap. Working on the book, Typesetting, by A. A. Stewart, for Project Gutenberg, I couldn’t help but reflect and wish I could have been an apprentice hand compositor and daydream about what the publishing industry must have been like when each character had to be manually placed in the composing stick; when the characters of each font were housed in separate type cases; when measurements for line lengths, page sizes, and margins, had to be mentally calculated quickly and accurately; when justification of lines was achieved by manually placing a mix of different space widths characters (and even resorting to “pieces of paper or thin card” if metal thin spaces were not at hand). Imagine being able to set type and be able to read the text upside down; to have the dexterity to take a piece of type from the case and place it in the case; to proofread the lines of type and correct mistakes before justifying the lines. Not to mention having to wash the type and placing each character back into the proper slots in the proper cases, so that the type pieces could be used over and over. Sitting at my computer, selecting fonts, messing about with HTML and CSS coding, I still want to be an apprentice hand compositor. “Typesetting, a primer of information about working at the case, justifying, spacing, correcting, making-up, and other operations employed in setting type by hand”, is an excellent training manual that gives me an insight into what I would have been doing had I been able to achieve my dream. This post was contributed by a DP volunteer.